Zero turn mowers were initially only designed for commercial use, such as on golf courses or football stadiums but it was soon realised that they could be a useful tool to the homeowner with a large area of lawn to cut. 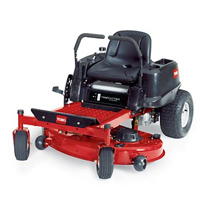 Zero turn lawn mowers are a special type of riding mower that you sit on whilst mowing and control using two levers. They are unique in the respect that they are able to do a full 360 degree turn. Spin On the Spot – Because you can do a 360 degree spin on the spot with one of these things, you can get right up close to any features your lawn has like trees, bushes or flowerbeds. Reduced Mowing Time – They save you time because they can get so close to edges that you won’t need to pull out the trimmer afterwards. The fact that you have no limit on the turning circle means you won’t need to make multiple passes to cut the same area of grass too. 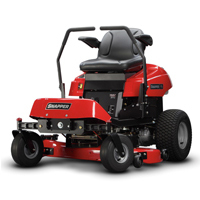 Comfortable Mowing – Most models of zero turn mower come with high back seats which offer maximum back support. Extremely Durable – As we mentioned earlier, they were initially designed for commercial use only and built to withstand heavy usage. The parts used are exceptionally high quality which offer great performance and a longer life expectancy. Just Easier – Nipping around on one of these is pretty fun and it saves your legs at the same time.